The Davis family of Vinita, in the Cherokee Nation has a very rich history. 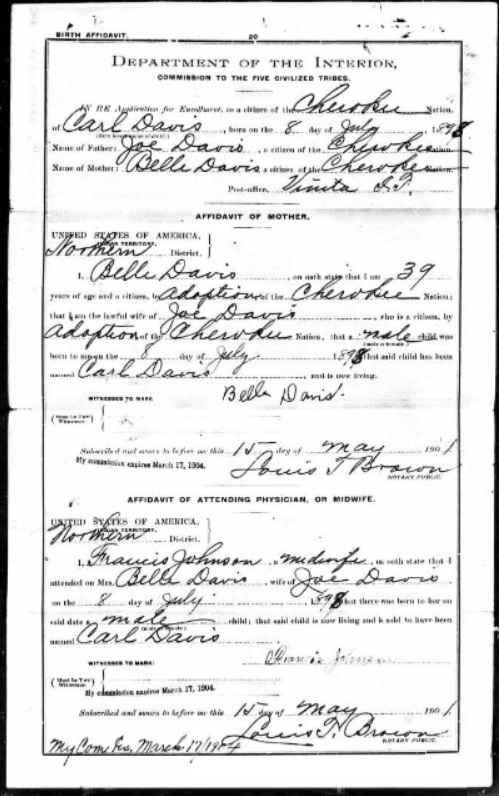 Joe Davis the patriarch appeared in May 1901 to enroll his family as Cherokee Freedmen. 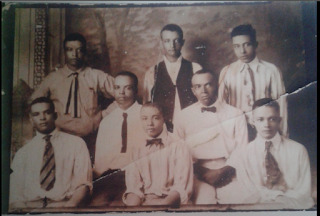 He provided the names of each of his children, Sadie, Willie, Thomas, Joseph, Dan, Carl, and Charles. Two other sons not on the card were adults and had enrolled on their own card. 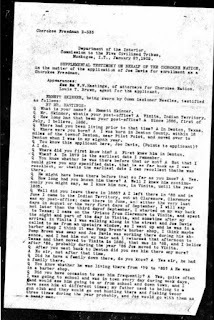 It is recorded that Joe had at one time been enslaved by Kinnie Davis. 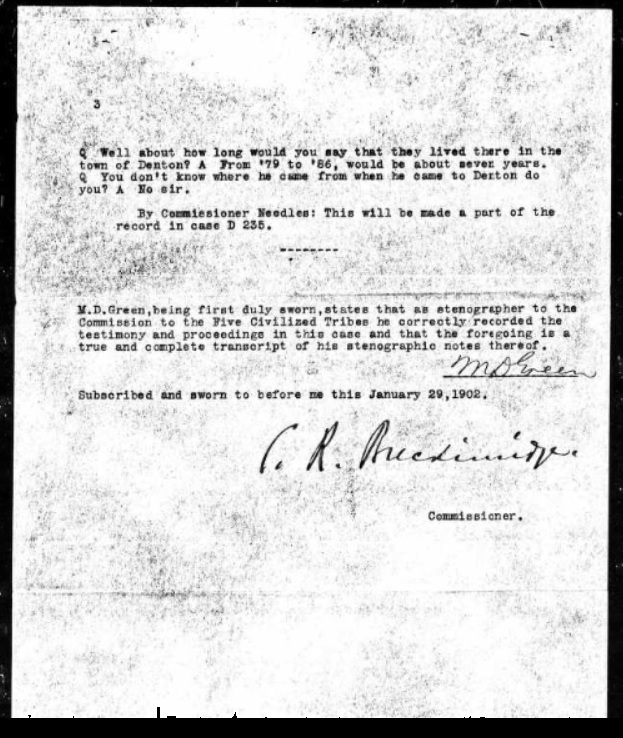 There are additional notes on the card referring to more information on the family. 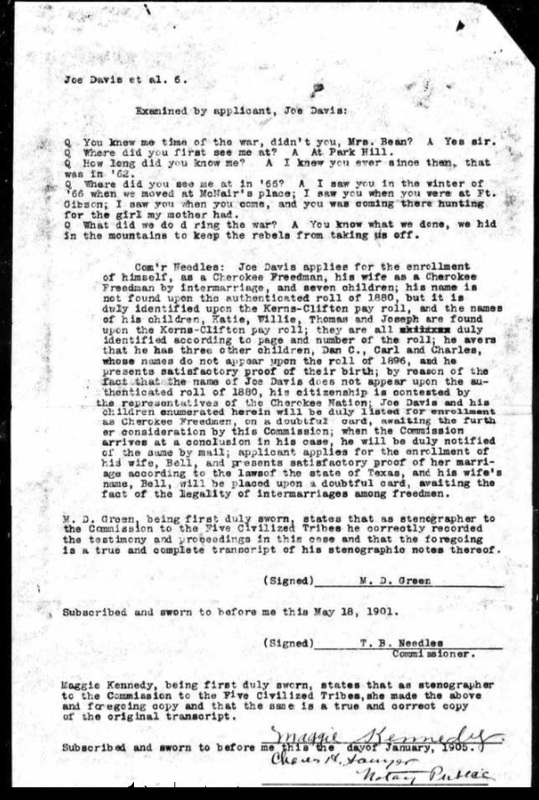 The Davis family names had also appeared on the Kern Clifton Roll--referred to at the K.C. roll. 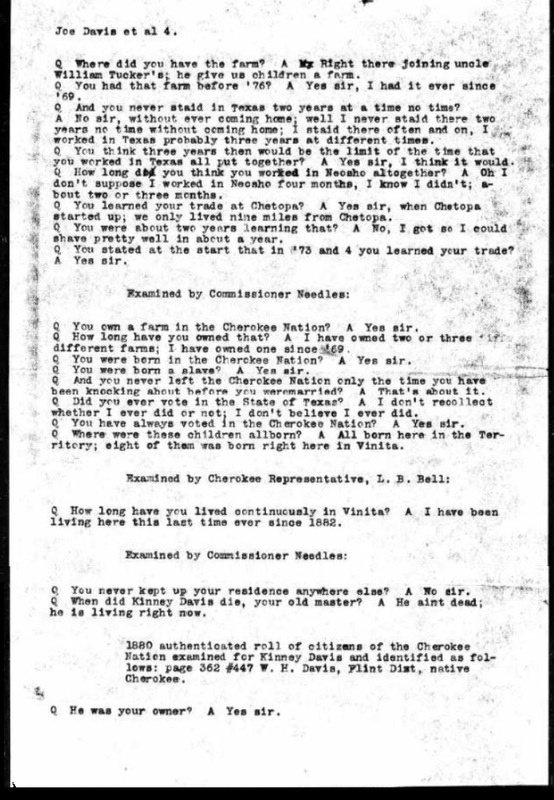 In the lower left part on the page it is noted that there are other relatives to be found on Cherokee Freedmen cards #1200-1204. His father was Tom Faught and his mother's name was Betsy Davis. Tom Faught had been a slave and was enslaved by Peggie Faught, and his mother Betsy was once enslaved by Wm. A. Davis. 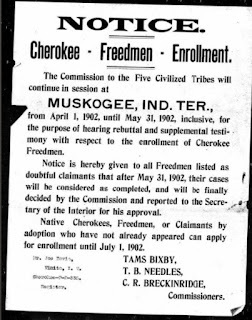 The family resided at that time in the Cooweescoowee District of the Cherokee Nation. 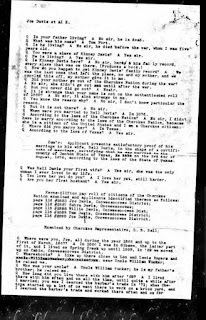 It can be assumed that Joe took the name of his mother as the family name was not Faught. No other information is provided on Tom Faught, other than the name of the slave holder. Also note--the family was originally placed on the "Doubtful" card as there was a concern about their eligibility for enrollment. Their names were later moved to an approved card in 1904. 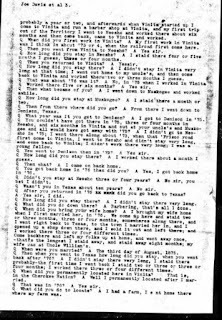 Joe Davis was interviewed on May 16, 1901 in Vinita, Indian Territory in the Cherokee Nation. 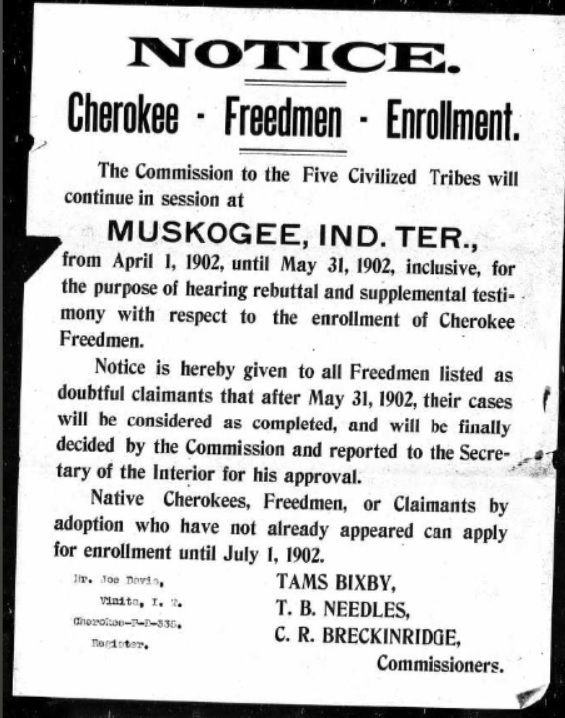 The questions began immediately about Joe Davis and his status as a recognized Cherokee Freedman. 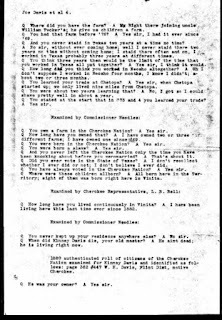 His name dd not appear on the 1880 roll of authenticated Cherokee Freedmen, which immediately made the commissioners willing to find reason to prevent his enrollment as a Cherokee citizen. He identified his wife and children when asked, and identified also the name of the Cherokee who enslaved him--Kinney Davis. His mother Betsey had died before 1880. 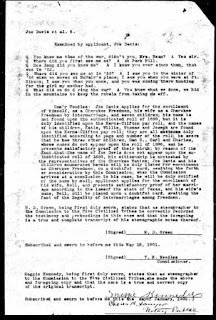 In front of the committee, he presented a record of the family, and he indicated that the record that he had was abandoned by the Davis slave holding family when they had left it the estate at the end of the war. 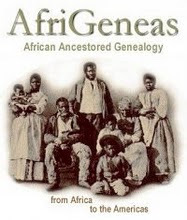 This is more than significant----Joe because he shared a document--a book that contained the names of all of the slaves held by the his family's slaveholders. The document is not found in this packet, and it can be assumed that he took it back and kept it. But on this page it is clearly stated, that he shared a book with the examining committee. 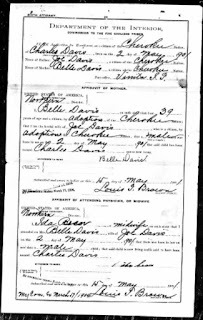 It should be pointed out, that few if any slave records from Indian Territory have ever survived, and at this time, , the Davis family still retained what they were able to found--a record confirming their own enslavement. 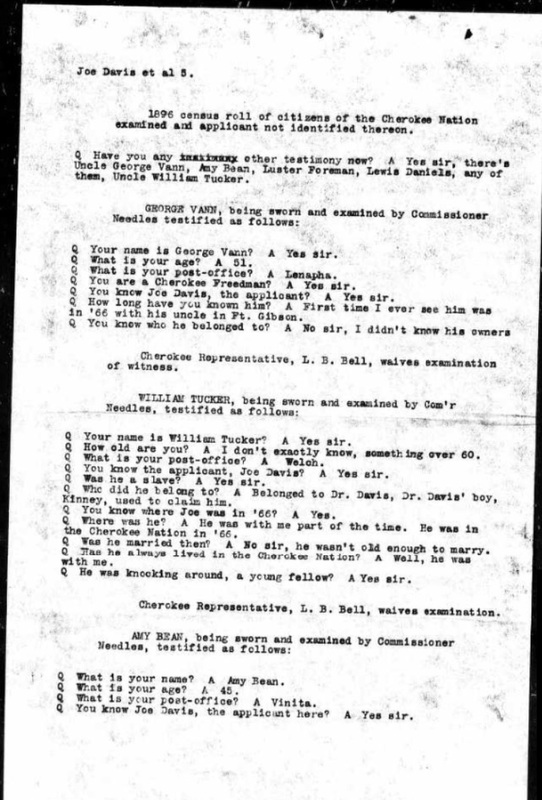 It this record still exists by the descendants it should be preserved or placed in a county or state archives or museum, because its is a very rare slavery era record coming from Indian Territroy before it became Oklahoma. Q. You were a slave of Kinney Davis? Q. Is Kinney Davis here? Q. 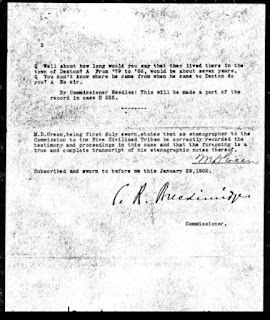 How did you happen to get Kinney Davis family record? A. We was the last ones that left the place, me and my mother, and we carried this off, my mother give it to me. This is probably the only case that may exist where a man once enslaved was able to prove the status of enslavement by producing the record that bore his name on the page! 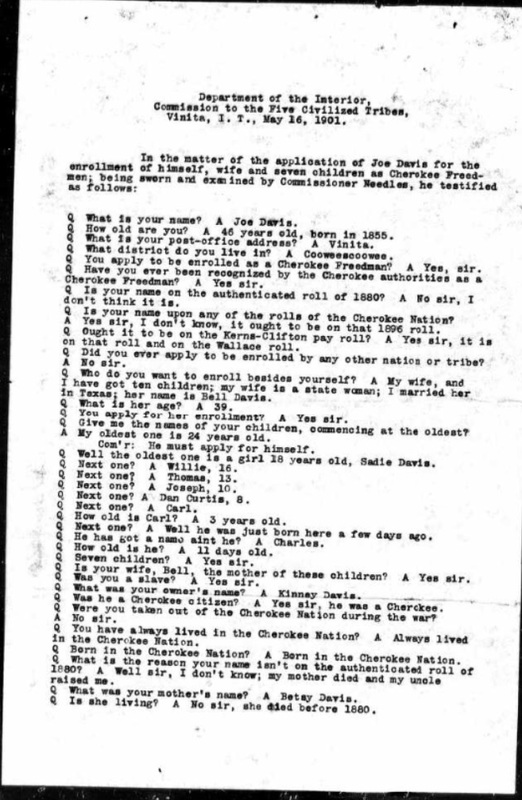 Joe Davis was then asked about his name not being on the authenticated 1880 roll of Cherokee citizens. His tone is one again of confidence. When pointed out that it was strange that his name did not appear on that roll, he replied that it as not that strange to him. The most striking remark then follows when asked about his marriage to wife Belle. 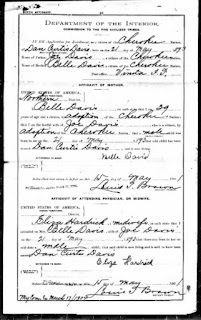 He was asked when they married, and he produced a marriage certificate from 1876. He was asked if this was his first marriage. Q. 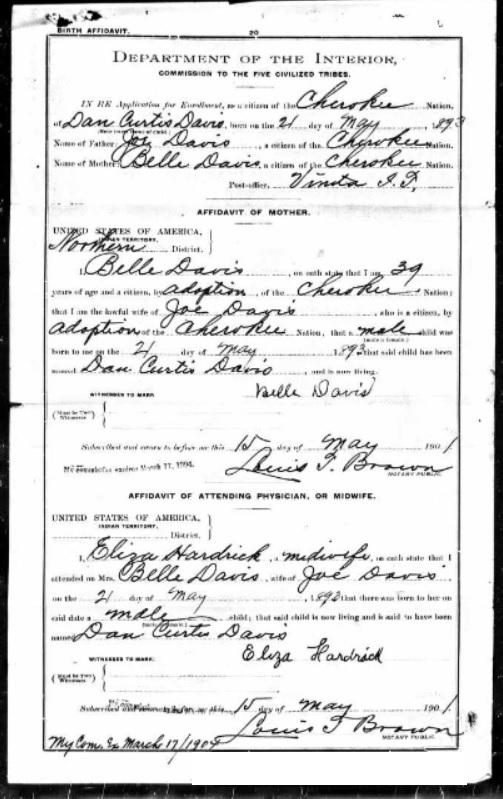 Was Bell Davis your first wife? A. Yes sir, she was the only woman I ever loved in my life. Q. You love her yet, do you? A. I love her yet, still harder. 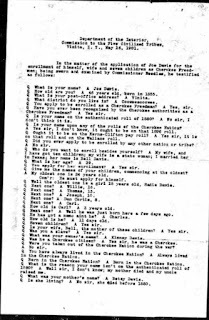 This kind of tenderness is rarely seen in Dawes interviews, particular since many of the commissioners were known to be harsh and hostile to the Freedmen being interviewed. 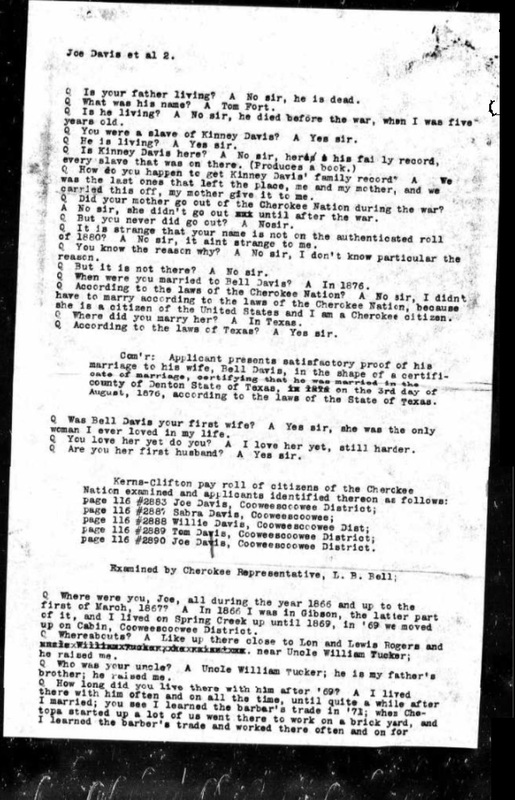 In this file, one gets a remarkable story of the movement of Joe Davis after the war. 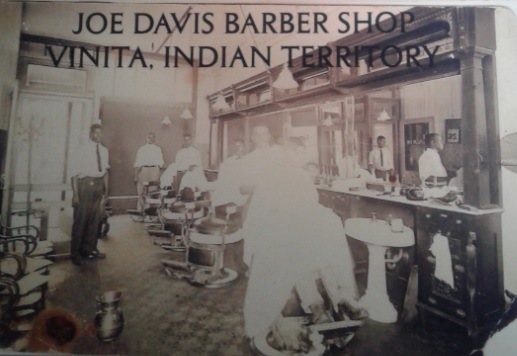 He pointed out in the previous page that he learned the barbering trade in the early 1870s and continues to document the various places where he lived and where. Between Vinita, Fort Gibson, Cabin (Cabin Creek), Texas and other places he lived and moved throughout the Territory. As much as Davis was moving around over the years, he was also resourceful. He acquired property and had owned one piece of land since the late 1860s. Others were called in to testify for Joe Davis--George Vann, William Tucker, and Amy Bean. 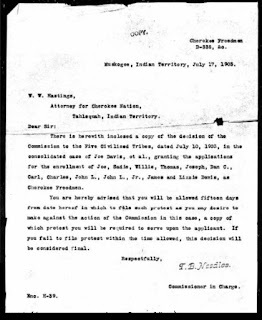 There was a need to verify that he was truly recognized as a Cherokee and that people had recognized him over the years. Another fascinating interview occurs when Amy Bean was sworn in. Joe Davis himself becomes the interviewer. He asks Amy how long they had known each other. She says that they knew each other during the time of the Civil War. Interestingly he also asks a fascinating question regarding where and what they did during the Civil War. Her reply again was remarkable and their exchange in general was amazing. Q. What did we do during the war? A. You know what we done, we hid in the mountains to keep the rebels from taking us off. 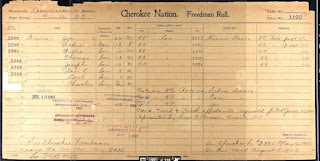 A long analysis of the status of the family followed with the decision to remove their names off the doubtful roll and to enroll them as Cherokee Freedmen. 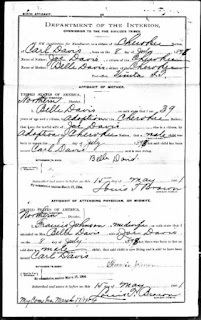 Three birth affidavits are included in the file for the younger children, Dan, Carl and Charles. 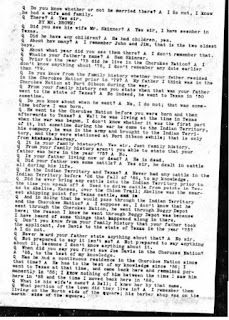 A final interview in the file appears with Emmet Skinner. He was a close acquaintance of Joe Davis and spoke of how they met first in Texas and later back in the Cherokee Nation. Again like the other interviews, the reader gets an amazing glimpse of life in a western frontier town in a small Cherokee town such as Vinita. 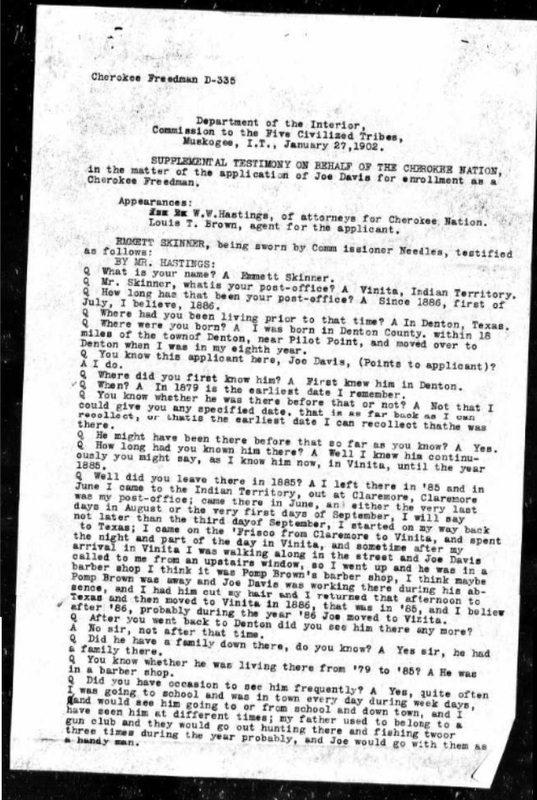 Skinner himself was not a Freedman and possibly not a Cherokee citizen, as he appears in some census years as white and confirms that he was from Texas. 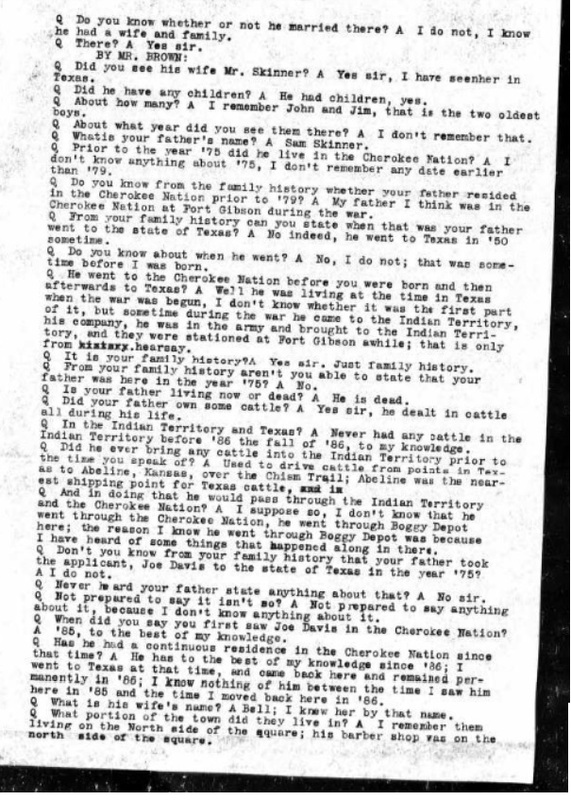 Nevertheless his interview also reflects movement and life on the frontier as his father was a cattleman. He clearly knew Joe Davis well, and he spoke even with knowledge about the location of Joe Davis's barber shop. This was a clear friendship and relationship that was one of two who had known each other for many years. 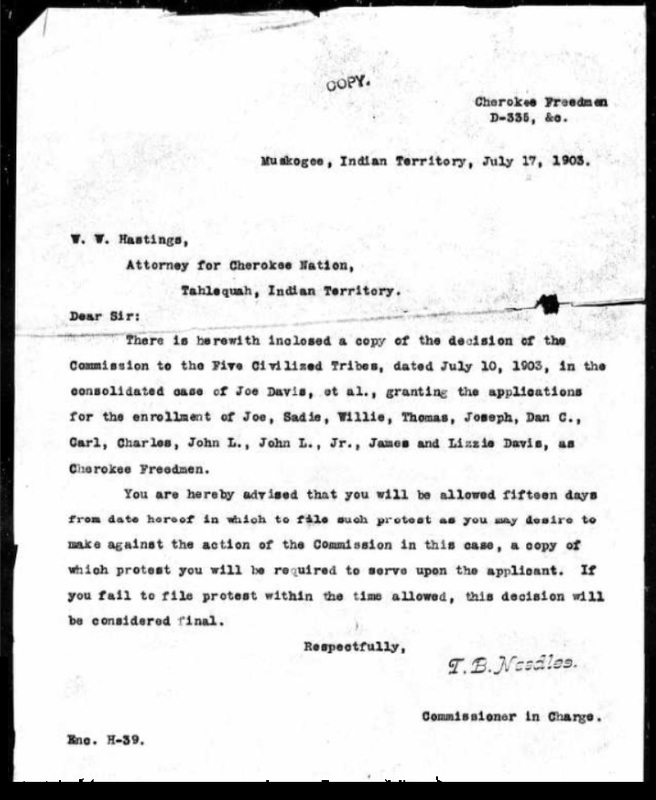 The file ends with other smaller memos including one with the resolution to enroll the family of Joe Davis as Cherokee Freedmen. Also an interesting recruitment poster also appears in this file. 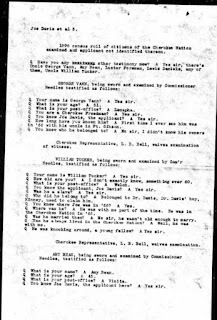 This flyer was widely distributed and one ended up in the Davis family's application jacket and is included here. There is much more that can be shared about this family, but these basic items are share here to record their story. 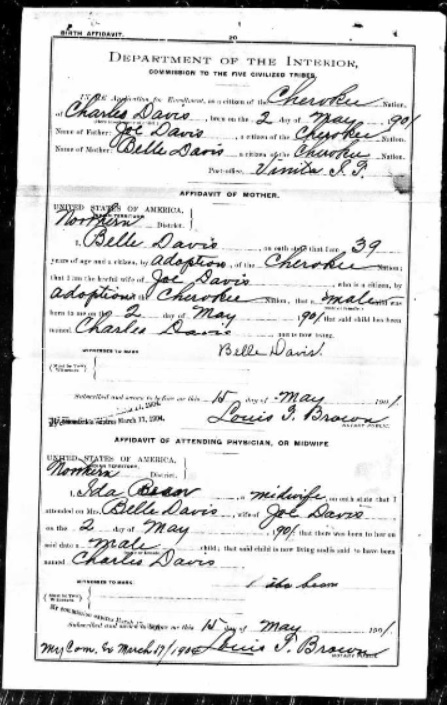 Special thanks to the late Steve Spencer, great grandson of Joe and Belle Davis, who allowed me to research and document his history in 2007. 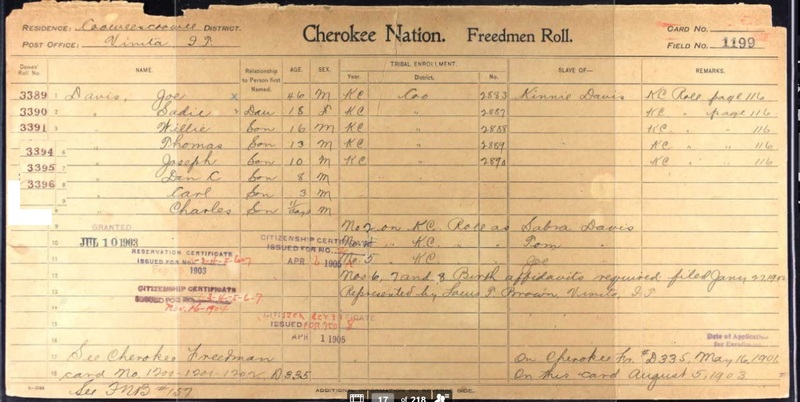 Hopefully these records from the Cherokee Nation, will be a part of the family's narrative permanently and that their story will endure. May they be forever remembered and these stories are shared in Steve's memory. 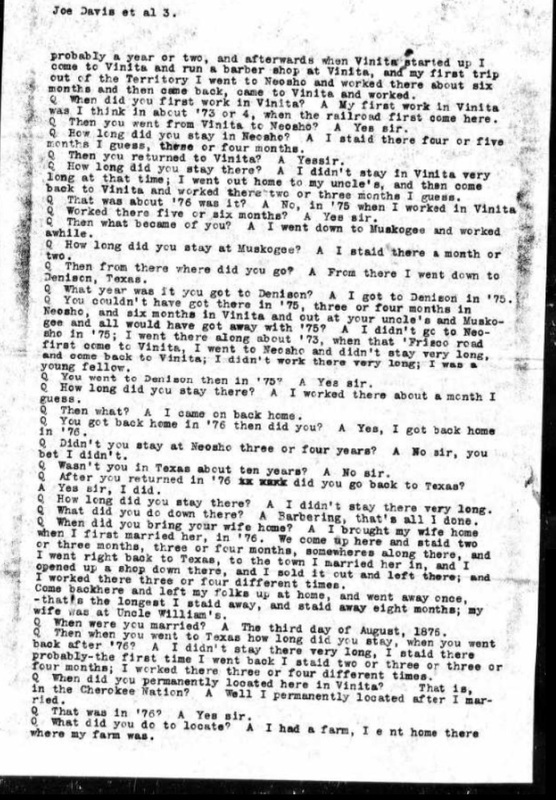 This is the 51st article in a 52-article series devoted to sharing histories of families once held as enslaved people in Indian Territory, now known as Oklahoma. 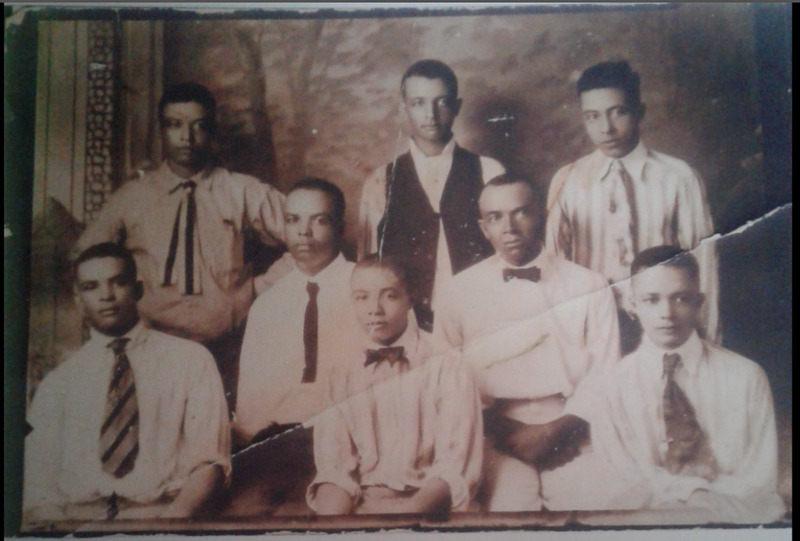 The focus is on the Freedmen of the Five Civilized Tribes, and these posts are part of an ongoing project to document 52 families in 52 weeks. Very nice and a great use of a blog. I am inspired but not enough to take on the challenge! :-) Thanks for sharing.